Any place that has a waiting time of one to two hours on a regular Friday night has got to be good. Coupled with a dedication to using locally grown food, Kona Bistro is sure to please both stomachs and the environment. 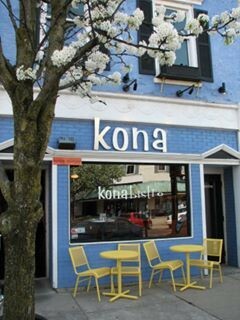 Located Uptown at 31 W. High St. in Oxford, Ohio, Kona has been pleasing customers since its grand opening in 1997 by current owner Tom Elliot. Elliot has been the driving force behind the restaurant’s focus on locally grown foods, claiming it stemmed from his personal beliefs. “I’ve always believed in starting in your immediate zone and reaching out from there,” Elliot said. What items are bought locally changes with the season, but especially during the growing season Kona purchases a lot of their produce from local markets. Additionally, they purchase their ground beef and steak specials from Reserve Run, a farm in Oxford that provides hormone and antibiotic free beef products. In addition to using locally grown food, Kona also strives to provide a varied menu with both vegetarian and gluten-free options. The gluten-free options Kona offers are part of what make it sophomore Victoria Thompson’s favorite restaurant in Oxford. “Most of Kona’s menu can be substituted for gluten-free options, and the waiters are all very knowledgeable about it. It’s nice because a lot of other restaurants will have maybe one or two gluten-free options, but Kona has a full menu,” she said. With a quality, unique menu and fun specials like $6 daily lunches, Kona Bistro is a great restaurant. It has the classy but fun atmosphere of a place you’d take your parents when they visit or perhaps have a birthday dinner with your friends. Next time you venture Uptown for a meal, give Kona a try. You may be in for a pleasant surprise!